Our day 3 at Krabi was filled with non-stop action featuring the Emerald Pool with the creepy blue pool, the hotspring at Krabi Town, the elephant ride and the challenging 1237 steps up the Tiger Cave Temple! 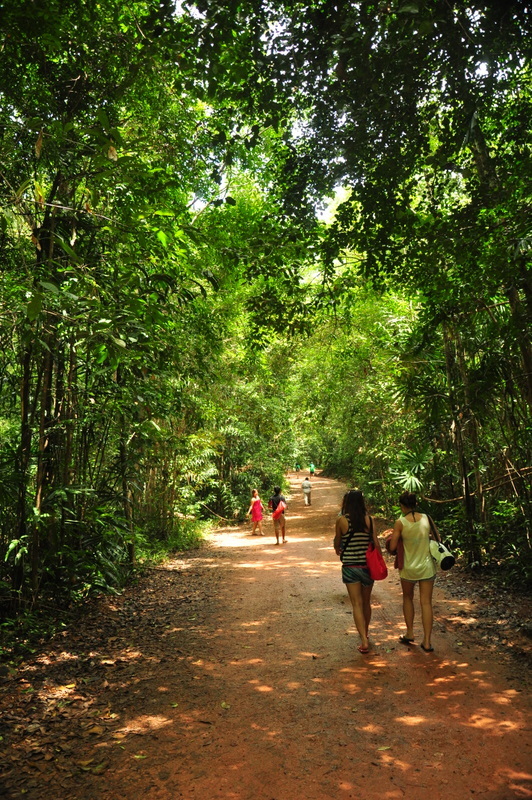 Read more on our Krabi Trip: Day 3 tour. Before I start, I want to emphasize that this is the most tiring day of my entire trip, not simply because this is the third day and I'm running out of energy. Today the driver was very punctual, he came right on time at 8.30am to pick us up. Along with another 2 groups of people. There are a total of 8 people, all from KL and 2 from Singapore. The journey to our first destination, the Hot Spring took about an hour. Midway, the rain started and we're getting worried it might ruin our day. Fortunately, when we arrive at the destination, the rain stopped (or maybe didn't start at all). 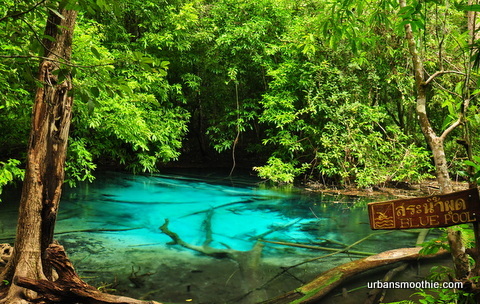 The place is simply called 'Hot Spring Waterfall' near Krabi Town. The hot spring pool that is open to public is relatively small. It can barely accommodate 10 people and all I can see is just a strong current of river flowing, but high waterfall pouring is nowhere to be found. We spent about 45 minutes there and then we depart for our next destination. Once we reach Emerald Pool, we are in awe and wonder how the water can be so clear. Just like chlorinated swimming pool. From the entrance itself, we can see small streams of river flowing, but to reach the Emerald Pool itself we had to walk nearly 1km long on the muddy path. When we finally reached the pool, the view of the big natural pool is astounding. The water is crystal clear and I suspect they definitely chlorinated it. Mr. B who is full of curiosity and ever adventurous attempt to search for the infamous blue pool. I was wondering where did he learn about the existence of it and regret agreeing to go along when the walk towards the pool took me forever. 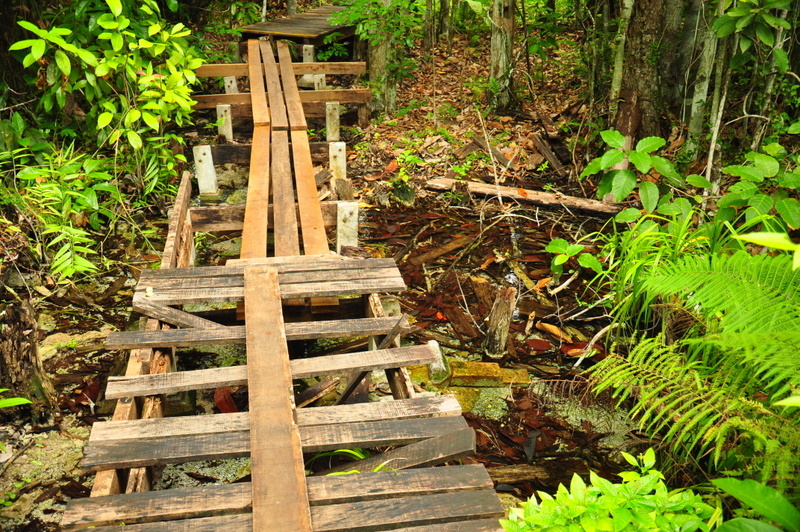 Before I forget, I want to emphasize that most of the wooden plank were either damage or rotten or eaten up by termites. When I find ourselves in the middle of nowhere, I felt a surge of panic attack and wondering if we never make it back, will they send out a rescue to team (with german shepherd) to look for us. There is not a single soul along the way and only us. 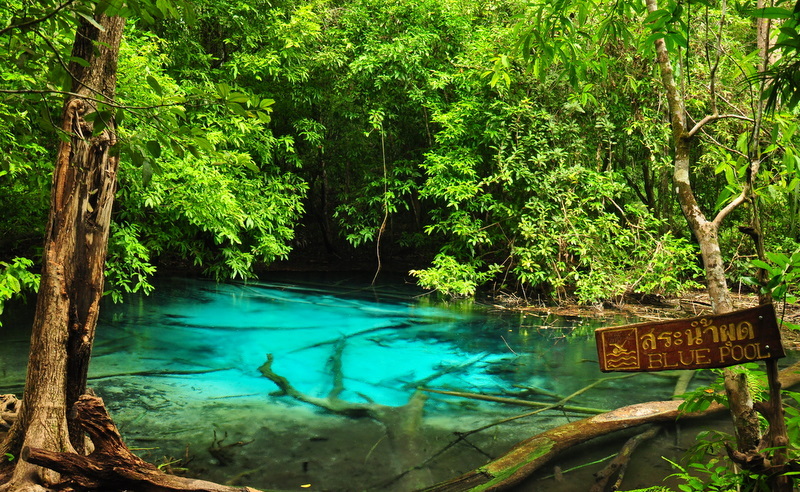 I imagine the headline reads : A Malaysian couple lost in Thailand while searching for the exotic blue pool. Thank God, at last we found it. The place indeed exist and it actually looks creepy to me. No wonder there is a sign saying 'No swimming'. Who knows what monster lives in there and excreting blue substances. I almost sprint all the way back to the Emerald Pool worrying if I delayed much longer, some wild animals might sense our presence and decided to check on us. After spending a short time dipping in the Emerald Pool, we walked to a nearby restaurant for our lunch. 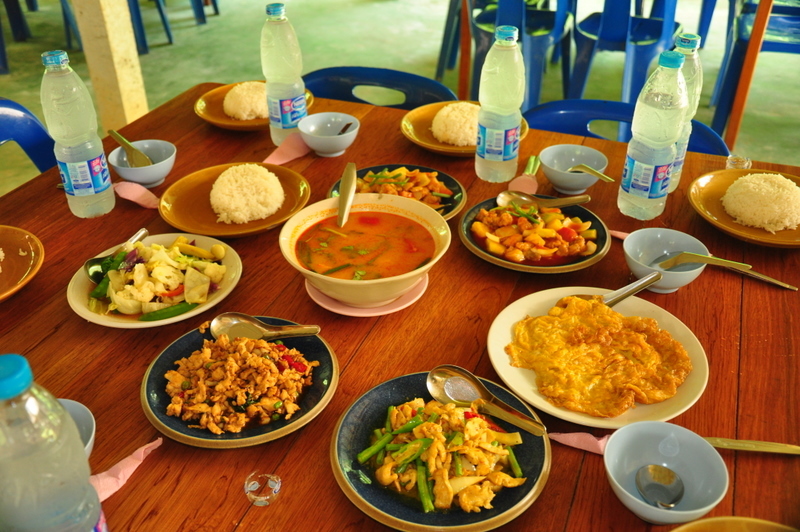 There is one tomyam soup and 6 dishes. Not bad, considering our past experience with tour package lunch, this is by far the best. 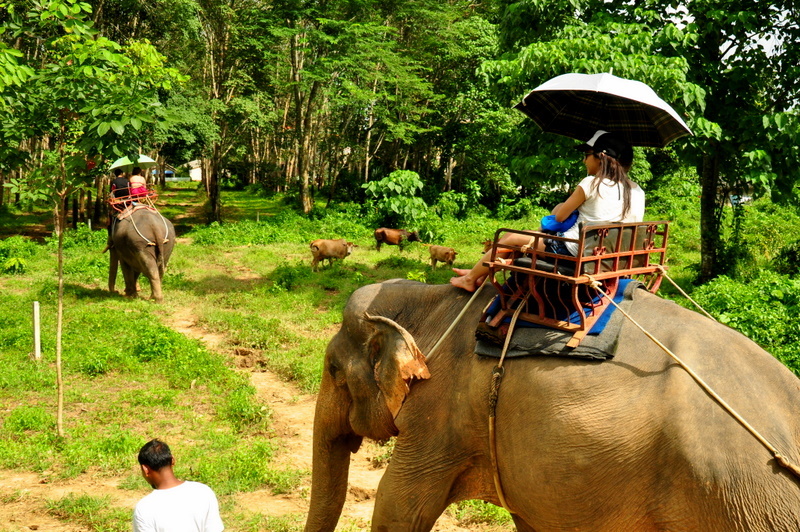 With our stomaches fully satisfied, we depart for our elephant ride. We were pretty excited as this is our first time riding on a giant mammal. Julia Robert in Eat, Pray, Love comes to my mind. Right after the completion of 50 minutes of elephant ride. I made a new resolution not to ride any more elephants. The poor mammal looks old and lack of motivation to even walk. And I do not understand why the man keep smacking at the poor fella. I wish I could throw verbal abuse towards the man and report to WWF or SPCA. Make him feel sorry for what he had done and beg for forgiveness. However, I know I doesn't have the guts for such heroic action. Therefore, I just decided not to ride them anymore in future, hoping they would eventually run out of business and have to release the elephant back into the jungle or sanctuary. Julia Roberts, you shouldn't ride either. Our last destination is the Tiger Cave Temple, which is the main reason of my complaint earlier in the post. You might think it looks like an ordinary temple from the outside. But I'm so wrong. 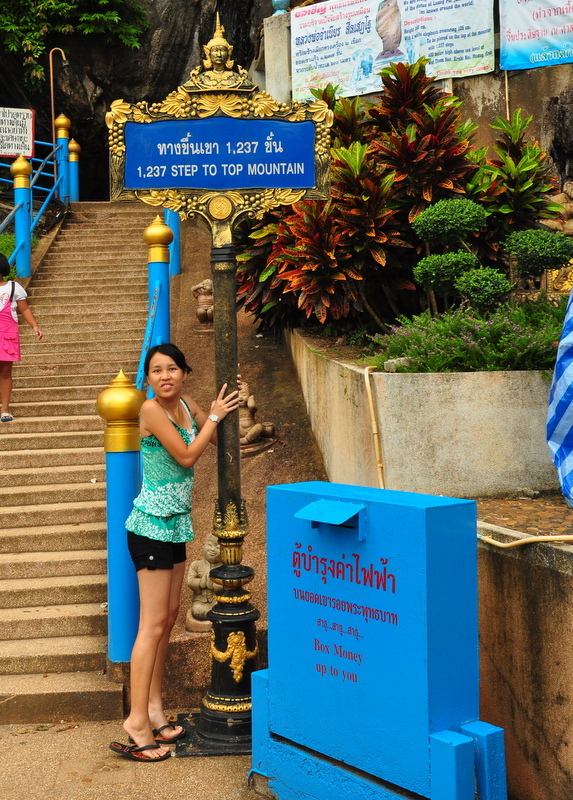 Hidden behind its facade is a total of 1,237 steps to the top of the mountain temple. If you think Batu Caves steps are tedious, imagine 5 times the amount of steps. And some of the steps here are so steep, I practically need to climb with both my hands. Just after scaling through 200 steps, I'm already half dead. Mr. B keep encouraging me, but mentally I'm already start cursing about this expedition. People on holiday are supposed to be relaxing and enjoying themselves, here we are torturing our knees. I might need to do a MRI back in Malaysia to check on my ligaments. While I was huffing and puffing away trying to catch my breath, there are this Caucasian couple bickering in front of me. The wife was complaining to her husband that this is torturing her (I totally agree) and she should be in her hotel sleeping instead (I want to give her a High 5). At this time, Mr. B is nowhere to be seen. I bet he already at the top of the mountain. What's wrong with these men? 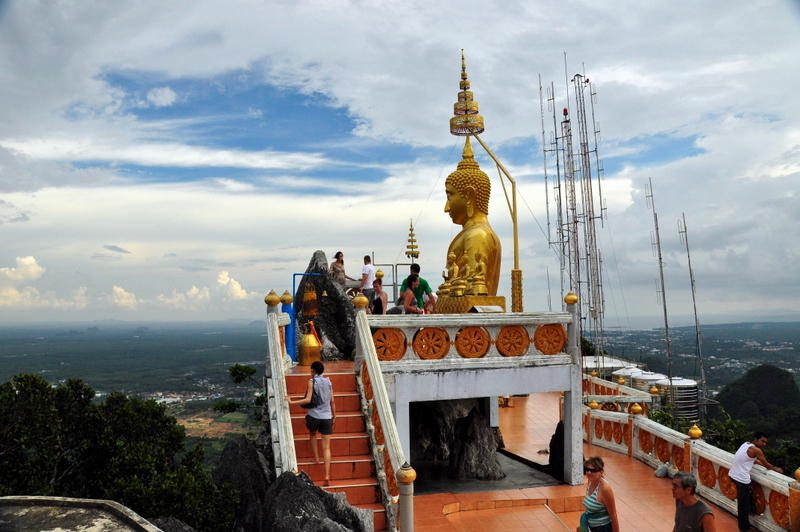 Okay, there is a temple on top of the mountain. Quite nice actually. But that doesn't worth the 1 hour torture of my knee and another half hour to descend. When we finally reached the landing, surprisingly with my knee still intact, I'm not surprise to find out that among our group, only 2 of us went for the climb. The rest of the group just sit there and waited for us for 1 1/2 hour.